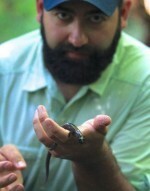 J.J. Apodaca is a professor of conservation biology at Warren Wilson College and Senior Co-Chair for Partners in Amphibian and Reptile Conservation (PARC). He holds a Ph.D. in evolutionary and conservation biology from the University of Alabama and a B.S. in Biology from the University of South Florida. His research interests include combining genetics techniques with spatial ecology to inform the management of endangered species and using geographic information systems (GIS) to identify priority areas for the conservation of amphibians and reptiles. He has been conducting conservation based research for nearly fifteen years, focusing on imperiled species throughout the southeastern United States.